This & That: A Quick Snack! The holiday season is in full swing around here and between last minute shopping, Starbucks Peppermint Mocha latte sipping, wrapping, removing baby E from under the Christmas tree, laundry, dishes, and what ever else may come up; there is barely enough time for anything... including this little blog. So here is a quick post on a super easy, remarkably quick, "MOM, I have to bring a snack to school tomorrow" (at 9:00pm) holiday snack anyone can pull together. Preheat oven to 200 degrees. Line a cookie sheet with the wax paper or tin foil. Line up as many of those little pretzels as you can fit on a sheet. Unwrap all 529,358 kisses (yes, I know there are not that many in there, but after the 10th one it will feel like there are). 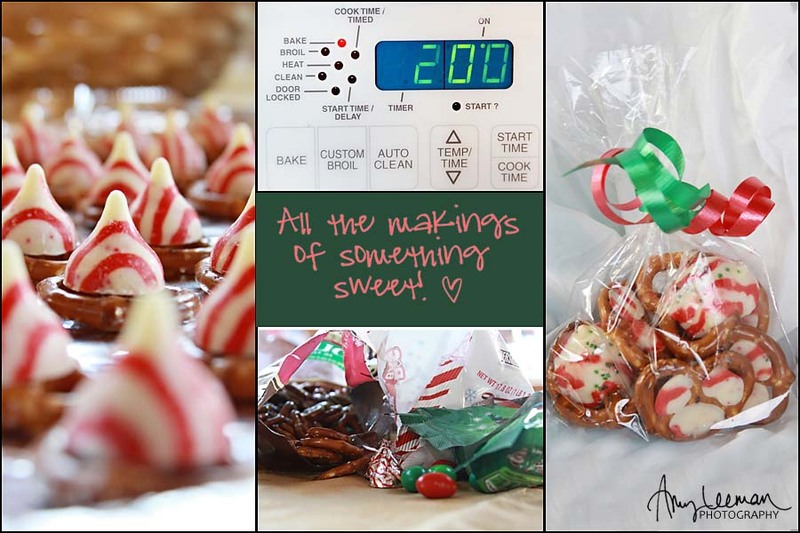 Place each kiss on top of a pretzel, carefully transfer cookie sheet into pre-heat oven. Bake for 4-5 minutes or until the kisses are melted. Remove from oven and sprinkle colored sugar. After each kiss is sugar coated, place the cookie sheet in the freezer for a few minutes until the chocolate has set. And there you have it - you are suddenly the Mom/wife/girl friend/co-worker of the YEAR!! There are many other variations to this recipe, some people substitute Rolo's for the Kisses and I have seen recipes where they use M&M's on the top instead of the sugar - to each is own! In my book when you have chocolate melted over a pretzel, you can not go wrong! You know Amy, I was going to say something like "Oh, Yum!" and leave it at that. Then I clicked on your image to enlarge it. I really like how in one image, albeit a mosaic, it told me everything I had to know to make the Christmas treat - ingredients, process, temp, and final product. I wonder if you could come up with a few more like this one, then sell them as a set of holiday cards (or postcards). At the end of the holidays the cards wouldn't get thrown out, they could go right in with the rest of our recipes. It is a very powerful thing, this recipe all in one instant, visual format. It is not in photograph form, but it might get you thinking. Winner of the Photo Shoot Giveaway!